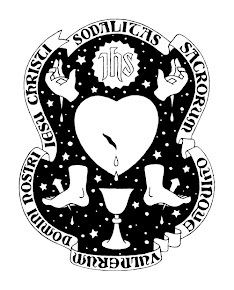 The name of the Sodality shall be 'Sodalitas Sacrorum Quinque Vulnerum Domini Nostri Iesu Christi' ('The Sodality of the Five Holy Wounds of Our Lord Jesus Christ') (hereafter referred to as 'the Sodality'). 1) The chief purpose of the Sodality is to foster in the hearts of the members a more than ordinary devotion to the Five Holy Wounds in order that they may lead a pure Christian life and prepare themselves to die a happy death. 2) The Sodality shall undertake from time to time a programme of pilgrimages and active good works. § 3. MEMBERSHIP AND OBLIGATIONS. 1) Membership of the Sodality shall be open to anyone aged 18 or over. 2) Nobody shall be considered a member of the Sodality unless he has signed the register of the Sodality. 3) The obligations of a member shall be to attend, when possible, the monthly Sodality meeting, and to say daily the prayer En ego, o bone et dulcíssime Iesu for the good of the Sodality and its members. 1) The Sodality shall appoint Officers who will attend to the business and good running of the Sodality. 2) Only members of the Sodality shall be eligible to hold Office. 3) Officerships shall be tenable for one year only, renewable by the usual means of appointment. 4) Appointment shall be made by common consent of the Sodality membership as a whole. 5) Nominations to hold Office shall be received by the end of the Sodality year, with elections held during the Summer recess. 6) A two-thirds majority shall be considered sufficient for election; in default of the required turnout the Sodality shall appoint whosoever was nominated with the most votes. 7) There shall be four Major Officers who shall be the Trustees of the Sodality, namely, Prefect, Vice-Prefect, Secretary and Treasurer. 8) Minor Officers shall be appointed as thought necessary. 9) The Major Officers shall meet once a term, that is, twice a year, as a Board, and shall attend to the business of the Sodality, discharging their duties carefully. 1) The Sodality shall appoint a priest as its Spiritual Director. 2) The Spiritual Director shall be in good standing with the Catholic Church. 3) The Spiritual Director shall be elected by the same process as that for the election of the Officers. 1) The Sodality will meet once a month. 2) The usual practice of the Sodality at its regular meetings is to recite prayers, particularly those in honour of the Five Holy Wounds. 3) The Father Director, or a deputy appointed by him, should always give an allocutio at these meetings on some pious topic with especial relevance to the life of prayer of the laity. 4) After the Exercises members usually remain behind for discussion and recreation. 5) Non-members over the age of 18 shall be welcome at meetings. 1) There shall be two terms, the first beginning in September and ending in December; the second beginning in February and ending in June or July. 2) A term card shall be published giving a notice of dates, and the Father Director’s chosen topic(s) for the term. § 8. ORDER OF EXERCISES AT REGULAR MEETINGS. vi. Finally, a blessing is given by the Father Director (or his deputy). 2) Friday after the Third Sunday of Lent, on which a Votive Mass of the Five Holy Wounds of Our Lord Jesus Christ shall be said.